Let's be honest, when the summer ends most of us breathe a sign of relief because we can eat more of the things we love. We can have three scoops of ice cream instead of two or order a large latte because we have the chance to cover up a little with cozy sweaters and cute jackets. That's at least the case for most of the people that I know. I'm living in the land of endless summer so while the nights are really chilly I get temperatures in the 80's most of the time. I don't hate that though because it means I get to focus on what I'm eating right after a summer of gluttony and it gives me an excuse to hit the reset button on my eating habits. I was never big on vegetables until I started juicing. I juiced because I wanted to make sure my body received all of the nutrients that it needed in one shot since I planned on kicking my diet into high gear. I did a three day cleanse with my cousin and ever since then I became hooked. I loved the idea of getting everything all at once and not having to worry about it throughout the day. After a couple of months doing this I realized that if I was juicing to put healthy things in my body then I had to start buying organic. I felt that anything but organic produce was counteractive to what I was trying to achieve in terms of getting my body healthy inside and out so I started purchasing them from my local supermarket even though I felt it was sub par. I knew I could go to other markets but this was the closest one to me and fit better with my sometimes crazy schedule. 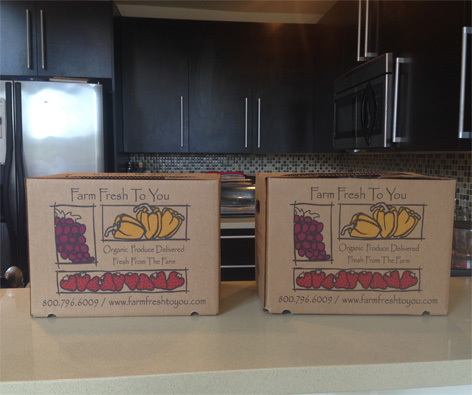 Lucky for me I was given the opportunity to try out a food delivery service called Farm Fresh To You and write my thoughts on it. The first thing that popped into my head when I went to Farm Fresh To You's website was how cool it was to get locally grown organic produce delivered. Once I set up an account with them I was able to choose what type of box I was looking for: mixed fruit and veggies, no cooking, fruit only or veggies only. I chose the mixed box because I wanted to get a variety and while I'm not huge on fruits they work well in adding flavor or releasing nutrients in veggies. After a few days I was able to enter my box and see what was chosen for me. It was an even mix of fruits and veggies but I wanted it to fall more on the veggie side so I had to wait until two days before my delivery date for modification. Once it was time I was able to customize my box and that was that. Two days later the packages arrived at my doorstep and I was excited to dig right in. When I took everything out I was amazed at how fresh and gorgeous everything looked. 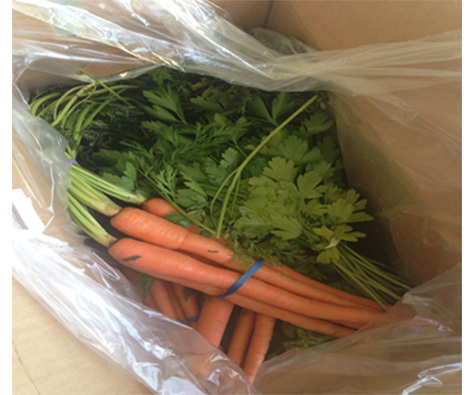 The carrots still had their greens, the chard was huge and the mint smelled delicious. I couldn't wait to get started on my juice. 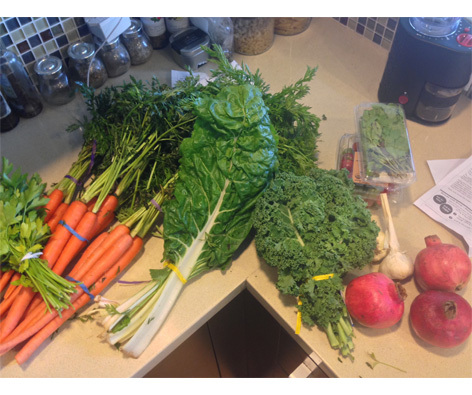 I received 12 types of items but decided to make a juice using carrots, cucumbers, kale, chard, mint and lemon. When I made the first part of my juice I had to stop and admire how beautiful the color was. 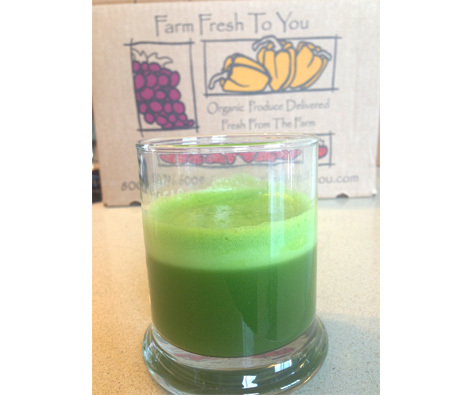 It was made with the kale, chard, mint and lemon and if it wasn't for the beta-carotene I would have stopped there. Once I mixed that in with the carrots and cucumbers I was ready for my afternoon snack and it was delicious. I really like that they get their produce from local farmers because it means I can get them quick and when they're fresh. They don't bag any of the items so if you're used to bagging your veggies like I am it might be a bit weird putting them in your fridge but I plan to make at least one juice a day so they won't be in there long. If you want to give Farm Fresh To You a try you can receive a $10 credit for using my referral code (DIAN3551) and will be on your way to fresh, organic produce at your doorstep in no time!